The NAB Challenge is over and we have almost all of the information that we need to know to get our teams sorted. Discuss them here in My Team! The NAB Challenge is over and now we can start finalising our teams. Whether it is your AFL Fantasy team, your RDT squad or anything else, My Team is where you can post your sides and chat about different players, strategies, etc. Be a giver if you want to be a taker! Hit reply on someone else’s comment and give your two cents to keep this community strong. It’s going to be a big few days as he head towards the first lockout on Thursday 7:20pm AEDT. Something a bit different. Cheap backline (assuming goodes plays R1) and loaded up in mids and fwds. Banking on most premo defenders not doing that much better than the kolo, hunt, goodes types. Hey man, what scores do you expect from Smith and Hunt? They are both on my maybe list. And are you using Ellis as a stepping stone to Rocky? Tossing it up between a few players, so thoughts on? I’d go Kolo for his price over Malcesk as i think eski will be tagged week in week out. Not sold on either of Rich or VB… they look like averaging 70-80. If thats the case then they are both costing you 150k more than a decent rook who won’t average much less, and they are both not going to make you as much $$$ as that decent rook. I think you could use with one more premo fwd….if vandenberg is elevated jump on him for Heeney both likely will play early games and score similiar output but vandenberg will save you $120k…Same deal for Goddard he’ll play but probably won’t average much over 60 better off going with someone like Oxley who pendles said is pushing for rd 1 selection…..I’d then use the cash to upgrade one of honeychurch or lambert…..K.Kolo should be in for a big year he’ll benefit through the malceski addition, as for rich and vanberlo I think there is alot better value mids this year so I’d look elsewhere. And if Ben Lennon can get in the side and avoid the vest definitely would be a very interesting pick. Interesting team. I love the Set and Forget Rucks and Adcock in Defence as a sneaky POD. I don’t think I’d change anything. Taylor is the only one I don’t agree with, but I do see the reasons some people are starting him. Great Team Beno. You should start Rocky and here’s why. With Ablett in doubt for Round 1 and having an interrupted Pre-Season, you need a bloke that can give you those massive 130+ scores. Let’s look at both sides of the story. If you start with Rocky, and he does what he did last year, you gain a massive jump on 72% of the competition (the last ownership stats I saw had Rocky at 18%). If you start with Rocky and he decreases in average to say, 110, that still puts him in the Top 5 midfielders last year. He might lose, say, $100-$150K, in the grand scheme of things, what is that? A good rookie will make that in two weeks. Since you will never be trading out Rocky (Barring an LTI) his price becomes irrelevant, once you have him. Now let’s look at the other side, say you don’t start with Rocky and he does what he did last year, or even goes bigger. How in the hell are you going to find the cash and/or trades to upgrade to him. He costs $100K more than Ablett. Where are you going to get that money from except from a downgrade. In other words, if Rocky even just MAINTAINS his average, it will take minimum losing two trades, and Gary Ablett to get him. Now if you don’t start with him, and he drops in price, you can pick him up cheaper, which is what a lot of people plan to do. It also gives you $150K that you can spend elsewhere. Congratulations, you just got Nic Naitanui instead of Matthew Luenberger, that netted you maybe, 10 points a week. You also missed Rocky’s scores for 8-10 weeks while you generated the cash to get him. In summary, I think the rewards of starting Rocky significantly outweigh the risk. He gives you a reliable captaincy option each week. Will undoubtedly be in the Top 5 mids at the end of this year, and if you start with him you don’t have to figure out how the hell to get him in later. Sorry, that was more of an article than a response, but I hope it helps. Excellent piece of persuasive writing there @Joke_R! Worst case scenario is he averages 110. In that case you’ve just paid about 130k too much for a top 8 mid oh well whatever. Also, Collingwood bleed fantasy points and as they will be sitting all over Beams r1, Rocky will be allowed to do whatever the hell he wants and gain 35+ touches. I’m predicting 170+ in that game and a huge advantage to the 17% believers. Hey guys, made a few tweaks to my RDT and I’d love your thoughts. 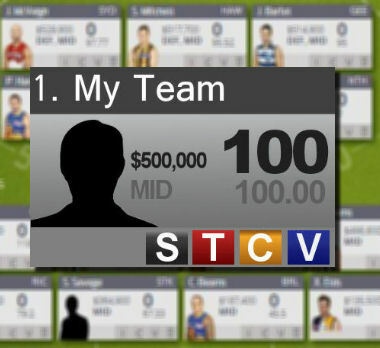 I’m not sure if I should downgrade Simpson to Jaensh, which would allow me to get Buddy and Lumumba in for Zorko and KK, but I feel like that’s a bit redundant, because then, the only way I’m freeing up the money to get more ‘Premos’ is by buying shittier premos. Anyway, I’m not sure. I’d love your thoughts on my team, what I could do with the truckloads of extra money I have leftover (lol) and whether it’s decent or not. I have Jaensch currently but some of the crows fans on bigfooty seem to think he might be out of favour. Sounds crazy to me but still a bit worrying. Not bad Fat Knife. Little too light on in the Rucks for my taste, but I guess that’s the idea. Love the inclusion of Sheed in the Midfield, Bennell up Forward and Wood in the Ruck. They’re all unique and I think they can do well. Broadbent is interesting. He has an entire DT Strategy named after him, but I feel like that will be his only lasting DT Legacy, not a great pick IMO. Honestly, I don’t think you have enough Premos and way too many Mid-Pricers. The chances of them all working are slim I would think, and if Fyfe and Ward don’t work out you’ll be stuck with a pair of Almost-Premos, and there’s nothing worse than being stuck with Almost-Premos. Bennell is my pick to be the breakout of 2015 and he has great early games. Fyfe and Ward are risky but both are with an Ablett upgrade in mind if they don’t work out. Ward is way underpriced IMO. I could drop Broadbent to Jaksch and get Jacobs/Gray/Prestia? I’m thinking the forward rookies are too good to pass up given how bad the defence options are and how vest-risky the mid options are. Fair enough. A lot of the Forward rookies tempt me too. Bennell should be good. I don’t know if you’ve seen Gold Coast’s early draw, but it’s wicked. I would do the Broadbent trade, drop him down to Jaksch and grab Jacobs or Gray. Otherwise, team is pretty good. I think you’re in for a good season. Upgrade or Downgrade for Rich?? Heeney is a gun i trained with him for 2 years, but a tad too much money. Hi guys. Got a few questions. How much will Hunt average??? i really don’t know? Still looking for a leauge? Definitely not excited about having mckernan as a starting ruck but i feel that if essendon do cop a suspension he may be able to play that second ruck roll under giles, freeing me up a lot of cash for an extra premo. Other uncertainties are bontempelli due to the fact he will take the tag from opposition and also higgins who has battled injury for a lot of his career. What is everyones thoughts on starting with ablet or lewis?